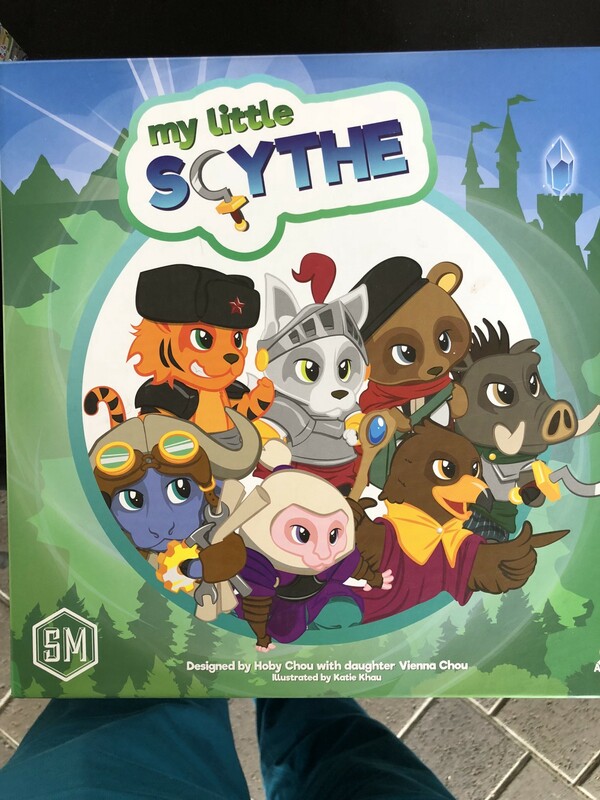 For the last few years, my daughter and I have made boardgames together. It’s become something of a tradition, and along the way I realized it’s an amazing educational tool. So here’s some of what we made, what I learned, and some tips to make your first game. We drew this with sharpie then added watercolors. 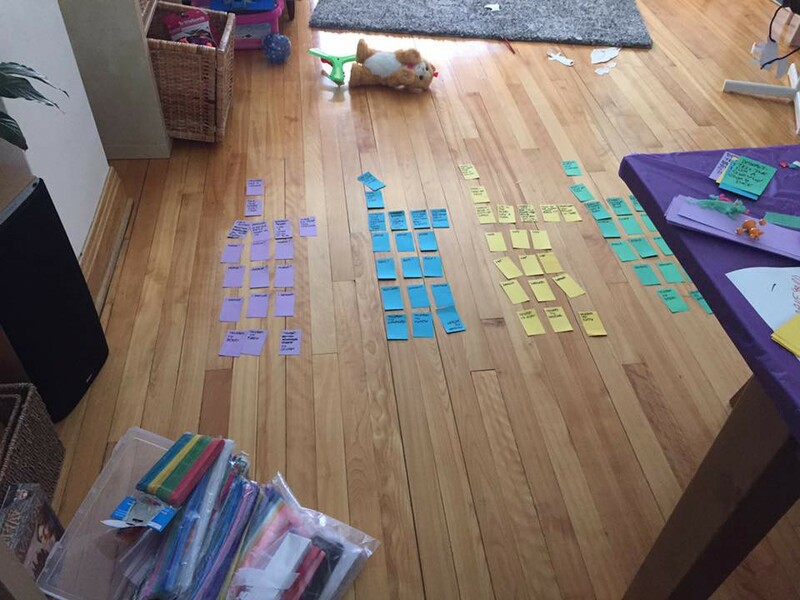 Writing the gameplay sequence down on a mat makes it way easier to learn. Our heroine, parachuting to an archipelago from a downed aircraft. But remember: The more complexity between you and the idea the less likely it is you can build a game in a day. So our best work has been with tangible things and tight iteration. When we begin, we don’t really have a full idea. The Diamond Quest game started with figuring out some monsters to fight; then Riley went and found seven gamepieces (actually the seven dwarves from Snow White) and she suggested we put elastic bands around them, and tuck the “inventory” items (written on little sticks) into these bands. This informed the rest of the design: Roaming the board trying to find materials to defeat the monsters. 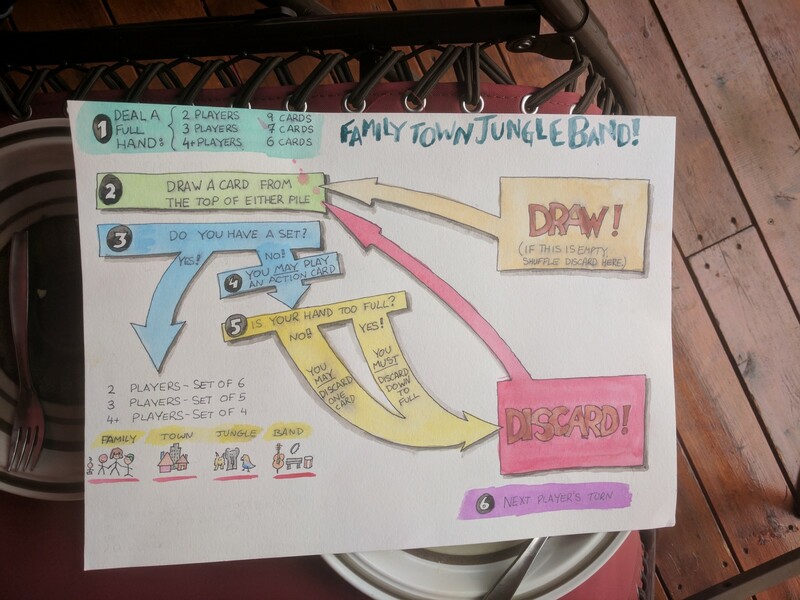 Similarly, the Jungle Town Family Band began with a discussion about sets of things (animals in a jungle; buildings in a town; members of a family; instruments in a band) and then turned into a set-building game. Doing this is great fun, and gives you a chance to build something together and then teach others. But beyond the obvious enjoyment of creating as a team, there are a ton of reasons to do this that I wish we’d see more of in school curricula. Making boardgames is a lot of art. 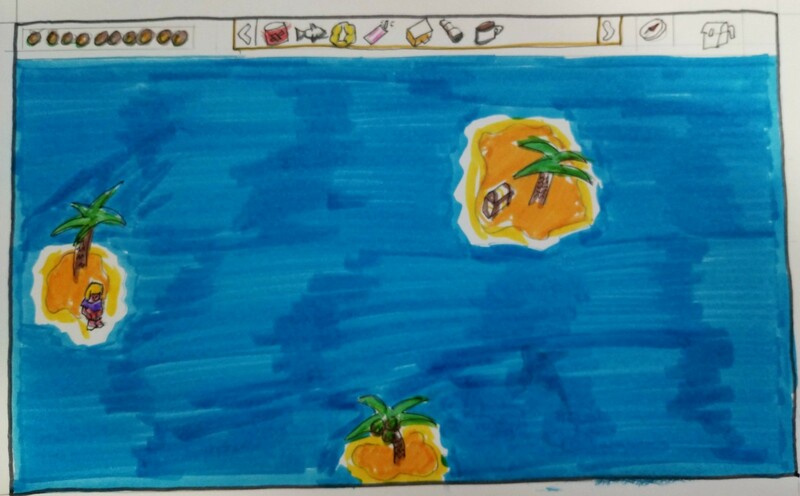 In some cases you’re also illustrating cards. (That’s fun, but it can get complicated quickly, as you’ll see below.) We often make gamepieces out of Sculpy/Fimo, which is perfect for prototyping. This was made with Sculpey and baked for a while. The Crayola air-dry clay works well for prototypes too. Tokens for the Potion Race: A snail (slows you down); a brain (feeds zombies); a flashlight; a grimoire (better potion success); a hat (keeps you warm against frost giants); a staff; a broom; an invisibility cloak. 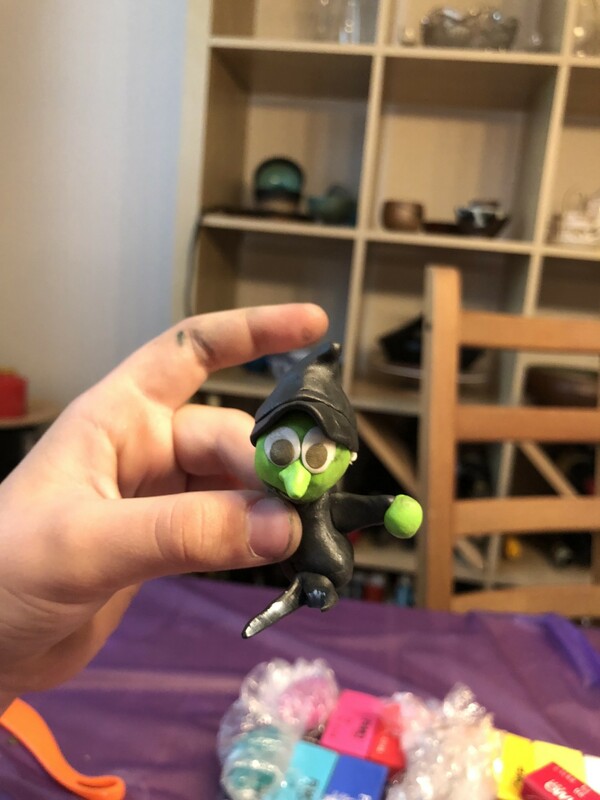 You can also use color-neutral Sculpey and paint on it, if your children like painting. As for the board, draw it with pencil first and try playing. Then use markers, and play again. And finally, paint with watercolors. When you’re playing a game, it’s immediately apparent if it’s unfair. If someone always wins, or some rule means things go on interminably, you’ll notice. Rather than fixing it yourself, you can ask, “how would you fix that?” Often, the suggestion for correcting an imbalance is to introduce another band-aid imbalance — and things quickly get too complicated. Then you can return to the underlying system and try to make it fair on a fundamental level. 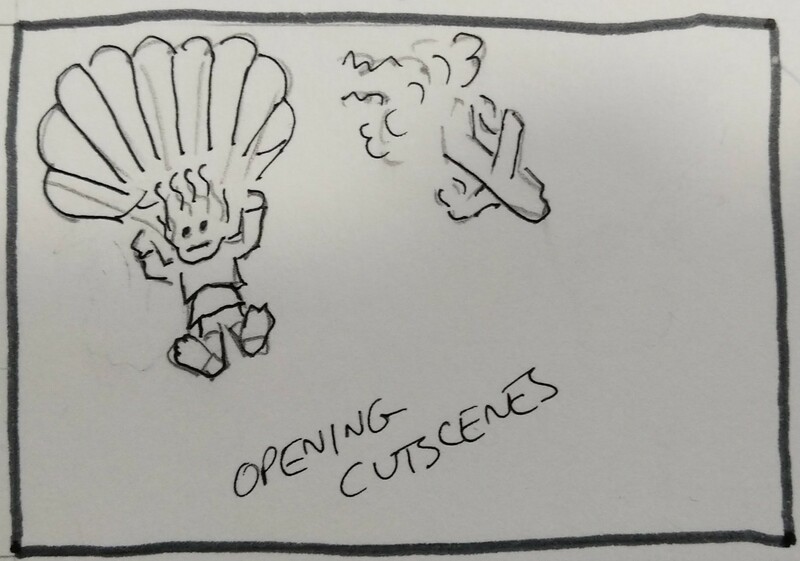 When you’re designing a game, you have to think about how others will behave. This is a great way for children to develop a theory of mind—and then try it out. Often, kids assume that everyone will do things the way they do. They believe that if they understand something, it will be obvious to others. (I think that) the sooner they realize this is not the case, the more clearly they’ll communicate and the more readily they’ll develop empathy. The first few rounds of play won’t work. That’s OK—talk about why they didn’t. This is a great way to convey ideas like the Minimum Viable Product (MVP) or iteration and improvement. When we first played Diamond Quest with other kids, we didn’t expect it to last. But they kept playing it, sometimes for an hour and a half at a time. It was unbelievable. An hour into their second game. 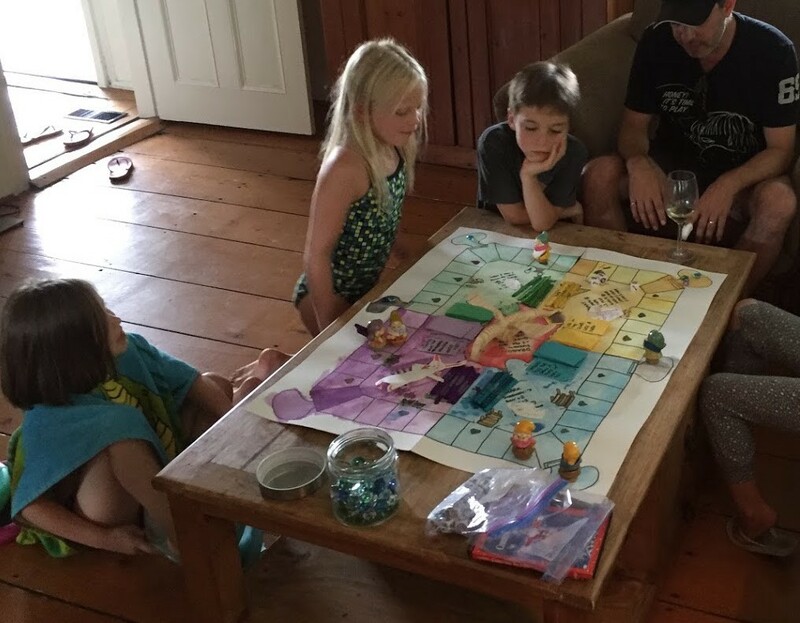 If you’re up for making a game with your kids, here’s what I learned. Poker chips, either as currency or tokens. Post-it notes. Great for making corrections on the board. Markers, ideally fresh sharpies; plus watercolor paints for the board. 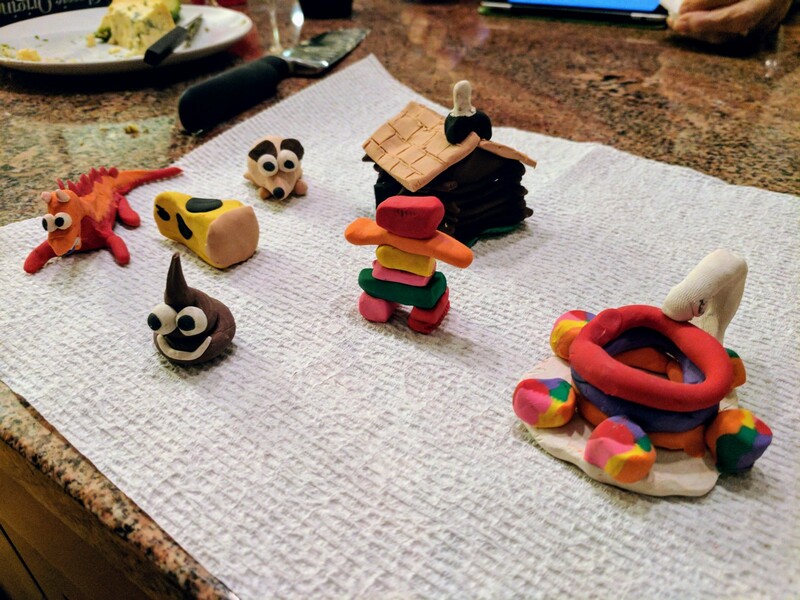 Sculpey or Fimo modeling clay, plus acrylic paints, for game pieces. Sheets of paper taped together, a big roll of paper, or foamcore you can draw on for the board. Ziplock bags to put it all in. Having more materials than you need encourages serendipity. 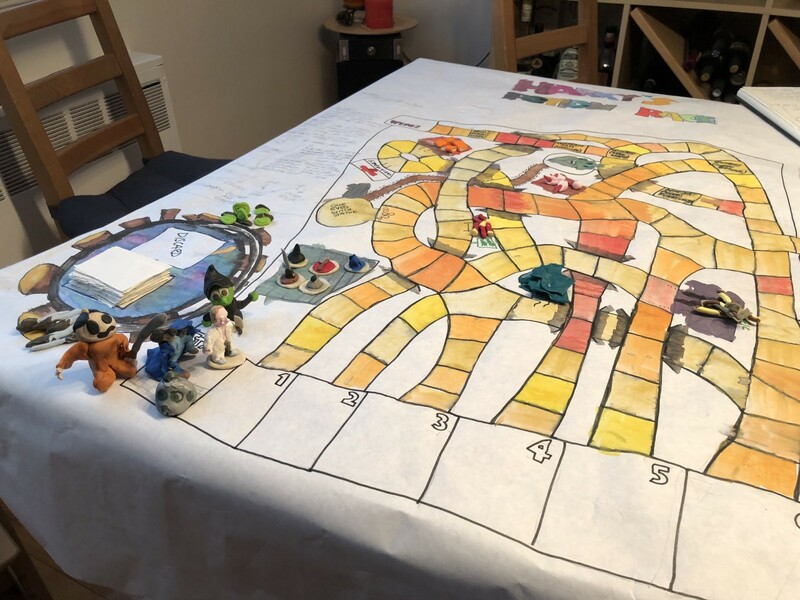 It also provides a quick solution to the inevitable suggestions your kid will make—if they want to add a game mechanic you need to keep track of, such as gaining gold, you can have a track on the board and move tokens along it. For your first game, use something familiar (like Snakes and Ladders) and just play with the naming and characters. Then add one idea (for example, certain squares make you draw a card that forces you to do something silly, or trade places with another player.) Don’t try to make an entirely new game the first time—the customization will be enough. As soon as you can, play a round of the game. Talk about what worked and what didn’t. See which part of the creation your child likes, and double down on that. Rope in others to play and see where they get stuck or what they don’t understand—and have your child try to explain it to them. They’ll quickly realize that being an expert is hard! Dice for movement around a board. Events when you land on a space, such as fighting a monster or gaining an inventory item. Some form of cooperation/sharing (a trading phase, or a way to gift something to another player. Story cards or dice where players have to tell a story and earn the approval of other players somehow. Secret tunnels or shortcuts. Everyone likes an advantage. Have a counter for health, or some other progress-meter element. You can do this on a small card or area on the board where players move tokens up and down as they progress, like a health bar in a video game. Ways to send the leader back to the start. If you can introduce an element that lets laggards catch up, this is a great way to help less experienced players win. The key is to have a balance of chance and strategy. Games that are purely random don’t tend to keep kids engaged unless there’s a storytelling element. But games that are purely strategic don’t encourage new players to join in. So there needs to be some way to advance strategically— building up inventory; having cards that give you agency over the gameplay or others; and so on—while still letting a roll of the dice put someone in the lead. One way we do this is with cards. A quick note on cards: Making cards can take a lot of time, and it’s something that the adult can do quickly while the child is making art. Cards probably need instructions on them. These are the cards for the Diamond Quest game. 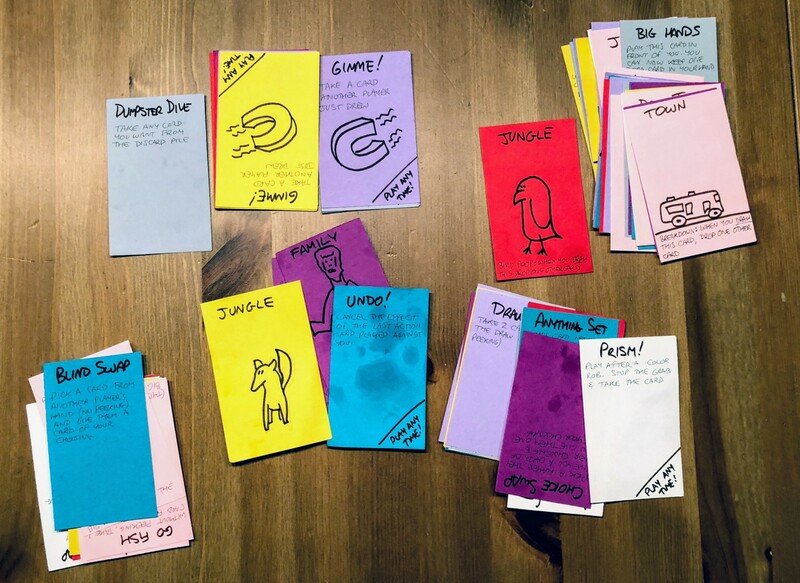 Coloured cards help a lot, and have become part of our game design (for example, in Family Town Jungle Band, you might get a card that says, “randomly take a red card from another player.”) But they can also get complicated — in the example above, each of the four corners of the game needs its own stack of matching cards. Of course, we haven’t actually finished that one, even though I put all these cards into a mailmerge and made proper printed ones. Things get complicated quickly when you try to improve them. The cards for FamilyTownJungleBand are pretty simple, but they took some fast illustration at first—and a lot of keeping track of each “suit” and color to make sure that the game effects were evenly balanced. This turned out surprisingly fun. I need to put the cards into something printable and make more decks. Sea shanty: Make up a 30 second song about something in the game and sing it. Binoculars: Until someone gets a diamond, you must look through your hands as if they were binoculars. Sloth: Until someone gets a diamond, you can’t use your thumbs. You may want to tape them to your hands. Attentive parents will also note this helps keep the players hydrated and physically active as well as engaged. So many moving parts. Fun, tho. In the game, everyone has a pair of game pieces that are siblings. Riley insisted on painting one of the adorable monkeys silver because, “she doesn’t have a brother or sister so she had to make a robot companion.” It’s that kind of backstory and narrative that makes the game engaging for young minds. 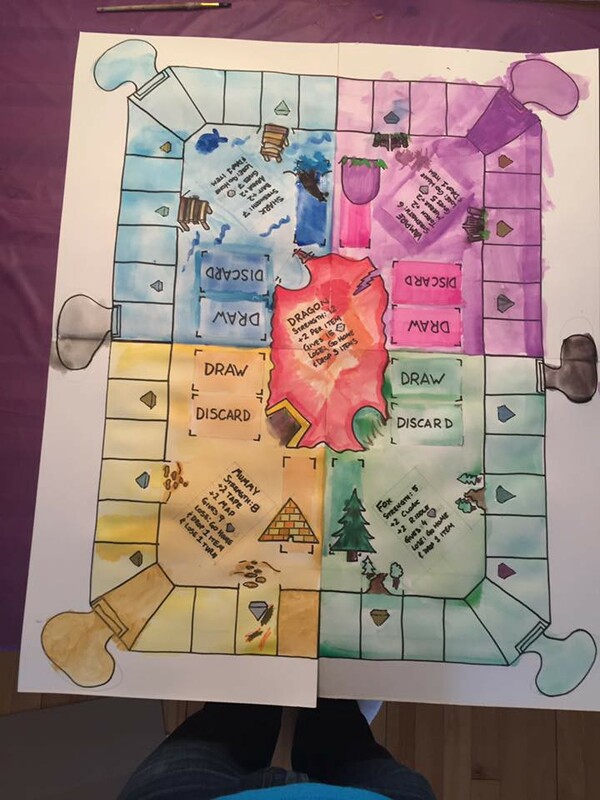 We write the rules in pencil on each gameboard, which means we can adjust and adapt them as we go. For the card set game, we made a playing surface that lists the order of events in a game—this kind of visual aide makes it easier to pick up a game a year later and play it. You can also see if the rules are getting unwieldy. In some cases, it makes sense for each player to have a mat on which they collect things like inventory. You can also use this to mark off progress, hit points, armour, or other stateful stuff. The odds are good that you won’t finish the game perfectly. You may want to start on an entirely new one; your kid may lose interest. You have to be okay with that. I’m a bit of a perfectionist around stuff like game mechanics; I have to keep reminding myself that the goal is to have fun and learn, not to produce a polished game you can retail on Kickstarter.